I love fresh yeast breads. Store bought, not so much. I’ll see one that sounds good; some “Artisan” type (also known as “we slapped the artisan label on this so we could charge you more”), bring it home, eat half a slice, say “meh”, then forget about it and the kids eat it. But most homemade breads I can eat my weight in… and trust me, that’s a LOT of bread. Russ decided to try his hand at bread baking the other day and I have to say, he did well for a first timer. He made whole wheat, which can be tricky for an experienced baker and he did fine. And this is a man for whom cooking means throwing a frozen burrito into the microwave. Seriously. When I met the man, he was practically living on frozen burritos and Doritos. It was a sad sad state of affairs. But I’ve since fattened him up and spoiled him for crap foods like that. So, since he made his whole wheat bread, I had to follow up; he got me craving fresh bread. I wasn’t sure what to make; obviously not whole wheat. So I went the decadent direction. Go figure…. me…making something not so healthy. Whoda thunk it? I have made potato bread for years. I have always loved that it’s a slightly softer bread, not as crusty as some others. But even there, I wanted to play some. So I finally decided I wanted to load this bread up the same way I load up a baked potato. So I threw bacon, sliced green onions and cheddar cheese in it, as well as replacing some of the potato water I usually use with milk and with sour cream. And know what? This bread is outstanding! This is one of those times when I’m like, “YES! Janet, you knocked this one out of the park!” This has a nice tight crumb, a tender crust that doesn’t turn into a pile of crumbs when you slice it and it has a enough “holdability” (yes, that is now a word.) to slice thinly enough to use for sandwiches. I mean; imagine this- a BLT on homemade bread that has bacon and cheese in it. Need I say more? This makes three loaves of bread, so either plan on sharing or freezing or if you’re better at math than I am, cut the recipe. I would estimate that if one were to cut this in half, you would get two 8 inch loaves. As it stands, you get 9 inch loaves. But it holds up well thanks to the potato. That helps it stay fresher longer. And like I said, this is amazing as a sandwich bread. This bread takes longer to rise than some, so don’t stress if it hasn’t risen a mile in ten minutes after you get it into the pans. Mine took a full two hours to rise enough to bake. But keep in mind that as it sits and rises slowly, it is also getting a better texture and flavor. Also, made during the warmer months, it may rise quicker. My house is rather nippy. Mrs. Cupcake- whose blood has now been replaced with yeast. And bacon. Preheat your oven to 350 degrees and get out three 9 inch bread pans.Add the cut up potatoes and one teaspoon salt to the 4 cups of water in a medium pot. Cook until the potatoes are tender then remove the potatoes from the water, reserving two cups of the cooking water (just dump any extra or if it isn’t a full two cups, add water to get up to two cups). Mash the potatoes well to make lump free, then let cool for about ten minutes. You should have about one cup of mashed potatoes. Add the one cup of milk and half a cup of sour cream to the reserved potato water. Whisk until smooth. Warm in the microwave in 20 second increments until it has reached a temp between 105 and 112. Sprinkle the packet of yeast over the top of it and give it a light stir. Let sit for about 5 minutes. It should be looking somewhat foamy by then. In the bowl of a stand mixer with the dough hook attached (you can do this by hand with a wooden spoon, but it will be an arm workout), combine the yeast mixture, the mashed potatoes, the butter, the tablespoon salt, the sugar, the softened butter and one cup of the flour. Mix on low speed until thoroughly combined. When combined, add in 5 more cups of the flour and mix on fairly low speed (I used 2 on my mixer) until it has come together into a sticky dough. Add more flour, half a cup at a time, until you have a slightly sticky and tacky dough. It shouldn’t leave dough all your fingers if you lightly push a finger into it, but it should feel pretty sticky to the touch. This took about 7 3/4 cups of flour for me. Let the mixer continue to knead the dough for five to seven minutes, scraping it down when needed if it crawls up the hook. Pour in the bacon, cheese and green onions and let the mixer combine them into the dough. Dump the dough out onto a lightly floured board or counter and give the dough a couple of quick kneads. Using the reserved bacon drippings, lightly grease the loaf pans; don’t use all of it- you’ll be brushing the tops of the loaves with it, too.Divide the dough into three equal pieces. Shape each piece into a loaf and put into the prepared pans. Brush the tops with more of the reserved bacon drippings. Let rise in a warm place until almost doubled in bulk. Since this uses just one pack of yeast for three loaves, it’s NOT a quick riser. So don’t worry if it hasn’t risen in like half an hour or so. It will get there. Mine took a full two hours to rise. When ready, put the loaves in the 350 degree oven. Bake for 25 minutes, then if desired, open the oven and quickly sprinkle some shredded cheese on top of the loaves. Continue to bake for about another 15 to 20 minutes, until the loaves are golden brown on top. If you’re not sure, poke an instant read thermometer into the center of a loaf. It should read at about 190 degrees. Let cool in the pan for five minutes, then turn out onto a rack to finish cooling. 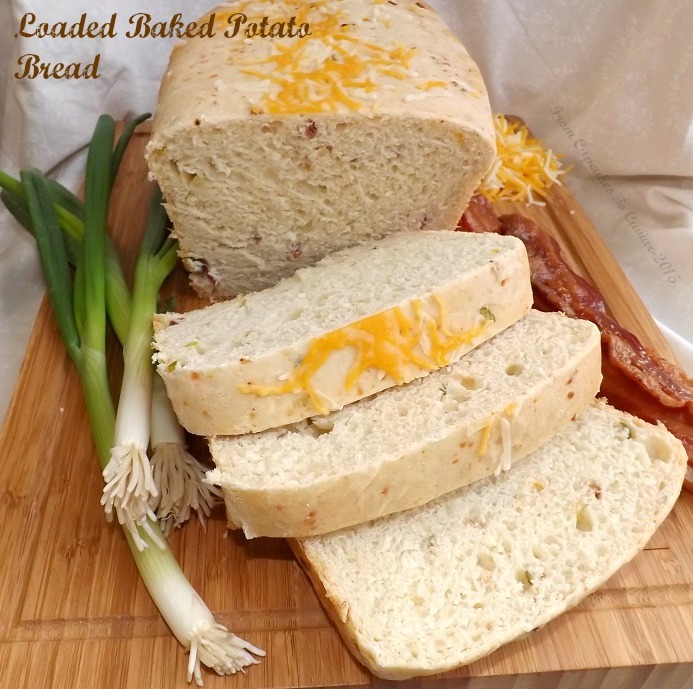 This entry was posted in Bacon, Cheese, Potatoes, Yeast Breads and Pastries by Janet. Bookmark the permalink. ooooooooh this bread is tempting me! so delicious!